A genus of treelike plants, reaching up to 5 m high, densely branched, candelabriform. Stems light green to yellowishgreen, with 7-12 ribs more or less sinuous, triangular, areoles situated in a depression. Radial spines few (3-8), central spines often absent. Flowers diurnal, remaining open at night, self-sterile, tubular funnelform to bell-shaped, nectariferous, white to creamy white, white tinged with pink to greenish-yellow, pollinated by hymenoptera (Apis mellifera, Bombus pensylvanicus, Plabela mexicana, P. frontalis, Xylocopa mexlcanorum), hummingbirds (Amazilia violiceps, Cynanthus latirostris, C. sordidus), bats (Choeronycteris mexicana, Leptonycterls curasoae, L. nivalis), more rarely by Sphingideae. Fruits small, spherical, berry-like, fleshy and juicy, becoming dark red when ripe, edible. Seeds rather small, hat-shaped, black, matt, tuberculate and striate. Dispersal ensured by birds and small mammals. 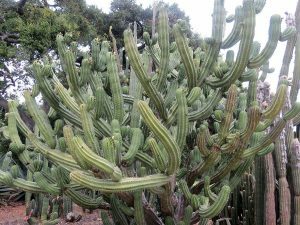 The genus Polaskia grows from 1500 m up to 2300 m or more in altitude (P. chichipe), in plains or on steep slopes, on clay or limestone soils, in xerophytic scrubs (matorral), together with spiny shrubs as well as other cacti and succulents.